This was the “smooshy ball” exercise. You can’t see it in the picture but we were all shaking like crazy! Holy abs! 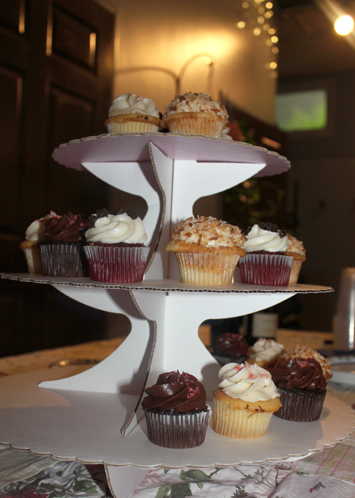 And then there were cupcakes. Sigh. My weakness. The good news is that they were mini so I didn’t do too much damage. I just can’t say no to Icing On The Cake cupcakes. I did take one home and eat it for breakfast on Saturday morning (nothing like making great choices to kick off a weekend). Bramble Berry gives Joy of Pilates two enthusiastic thumbs up. 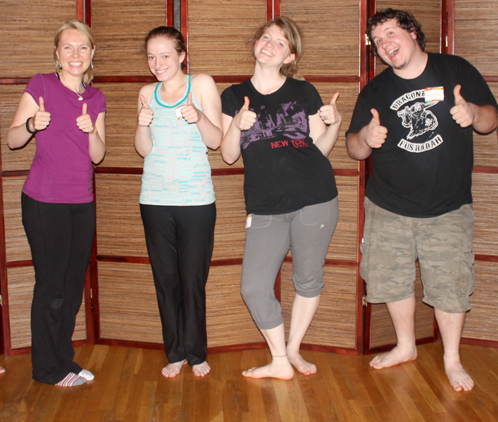 Can you tell we’re feeling invigorated and energized (and/or goofy)? 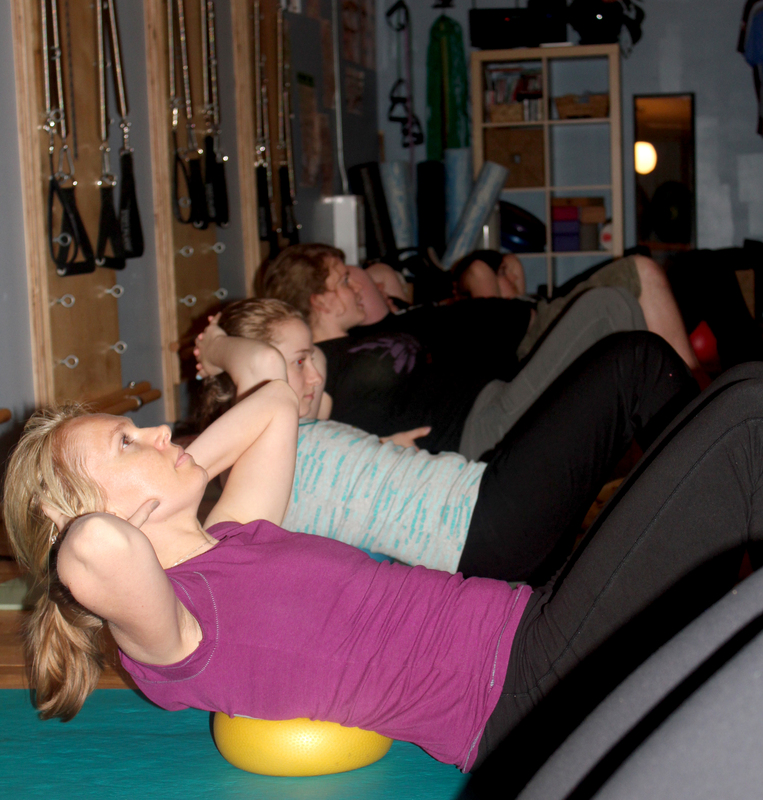 We were clearly on a pilates high! I wonder u and your energy. I’m ashamed of myself for nagging so much lately. How could you manage all those things together and, apparently so perfectly: Kid, household, business, sport and fun at weekend. That wall behind you looks like some kind of medieval torture chamber! Do terrible things happen to you if you don’t do all your reps?!? To the rack with her!! Cute! Looks like everyone had fun. You want to explain why you have 2 different socks on? LOL! I never wear matching socks. It’s a holdover from my ‘wild’ rebel youth. =) I just got way out of the habit and now, barely notice it. I don’t match Mr. Jamisen’s socks either. Which, of course, means that he will 100% love matching his socks as he grows up. 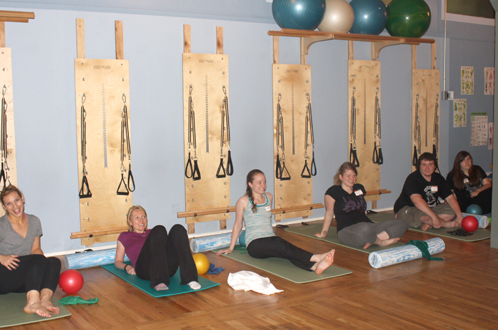 Yes, tons of fun at the Pilates party. I really feel so lucky to have such a passionate, joyful team. I love seeing all the fun things you do with your staff! Sounds like it’s a blast to work with you Anne Marie and your staff looks like a bunch of fun people.